FUKUOKA - Mongolian yokozuna Hakuho marked his return to the raised ring in style with a comfortable win over komusubi Tochinoshin on Sunday, the first day of the Kyushu Grand Sumo Tournament. But fellow Mongolian yokozuna, and Autumn tournament winner, Kakuryu failed to follow suit and suffered a stunning defeat against komusubi returnee Yoshikaze. Returning from a left knee injury that forced him to withdraw from the autumn basho in September on the third day, Hakuho put on a sumo clinic in the day’s penultimate bout, biding his time before sending Georgian-born Tochinoshin down with a textbook uwatenage overarm throw. 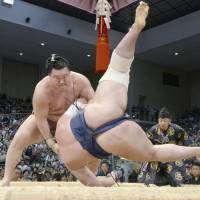 Hakuho has now won all 20 of his meetings with Tochinoshin. The most successful wrestler in the history of sumo with 35 career titles, Hakuho is appearing in his 50th meet as yokozuna, taking sole possession of fourth on the all-time list. Kakuryu turned out to be the only major casualty of the day after Mongolian yokozuna Harumafuji and all four ozeki made winning starts at Fukuoka Kokusai Center. Yoshikaze is back at the fourth-highest rank of komusubi for the first time in nine tournaments after a highly impressive showing in September, when he beat both Hakuho and Kakuryu, as well as two ozeki. 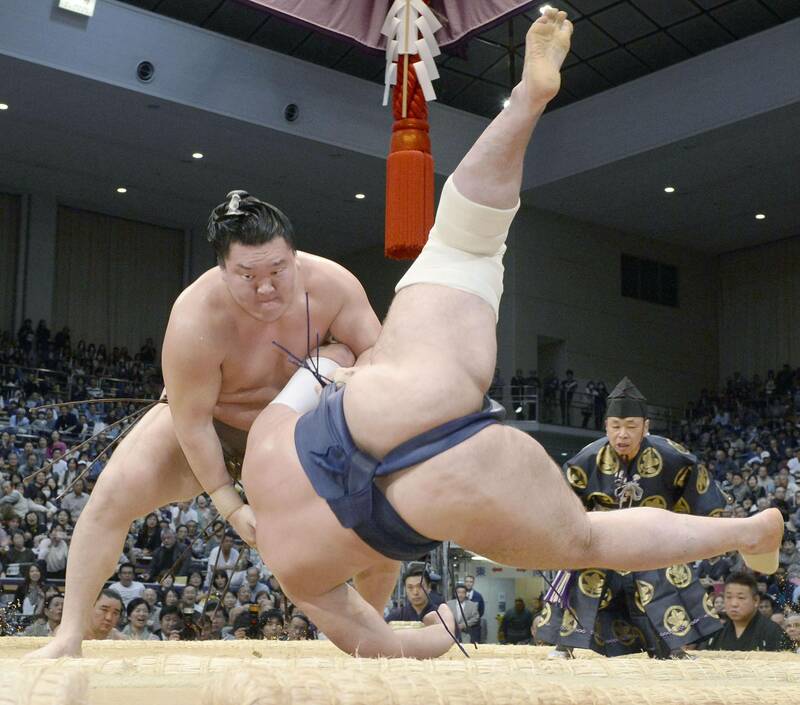 He showed that was no fluke as he spotted an opening and tore into Kakuryu before sending him flying off the dohyo. “I was bit nervous today, which shows I had a strong determination to win,” said Yoshikaze, who was awarded both the Outstanding Performance Prize and the Technique Prize, two of the three prizes the JSA gives to makuuchi wrestlers on the final day of a grand tournament, at the autumn meet. “I didn’t have a gameplan as such, but the yokozuna dropped back and I was able to get into him. Hopefully I can get double-digit wins at this tournament,” he said. Kakuryu ousted Terunofuji in a dramatic championship playoff in September, although his path to the title was eased by the absence of Hakuho and Harumafuji. Harumafuji, who missed the entire autumn tournament and most of the Nagoya basho in July due to a right elbow injury, showed nifty footwork before charging out sekiwake Myogiryu for an opening-day win. In other bouts in the upper ranks, Goeido got the first of eight wins he needs to keep his ozeki rank after going 7-8 record in September, forcing out second-ranked maegashira Okinoumi. Fukuoka-born Kotoshogiku’s yorikiri win over Bulgarian-born second-ranked maegashira Aoiyama was met with thunderous applause from home fans and Kisenosato shrugged off an early attack from Osunaarashi and bundled the Egyptian No. 1 maegashira out. Terunofuji was made to sweat but completed a clean sweep for ozeki by outlasting No. 1 maegashira and fellow Mongolian giant Ichinojo. Sekiwake Tochiozan got off to a losing start when he was slapped down by third-ranked maegashira Toyonoshima. In the lower ranks, No. 11 maegashira Mitakeumi, the only newcomer to the makuuchi division at this tournament, kicked off with a win by thrusting out 12th-ranked Takekaze. Mitakeumi scored a 12-3 record as a fifth-ranked wrestler in the second-tier juryo division last time out. He has reached the top flight just four tournaments since making his debut, the second fastest since the start of the (1926-1989) Showa Era.